Advanced 40hr Wilderness and Remote First-Aid with CPR-C - March 2019 West Coast N.E.S.T. This 5 day interactive wilderness first-aid certification course is ideal for outdoor guiding as it focuses on preparing trip leader for providing first aid on remote expeditions. This course may be full, check with T'ashii to be sure, as there may be space or more courses may be added. 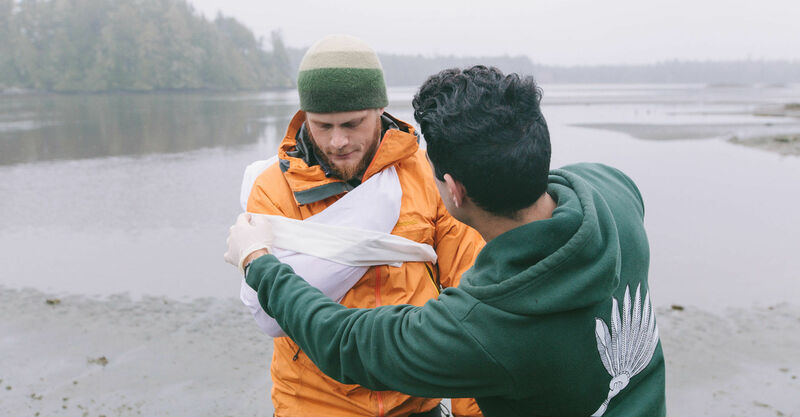 The Advanced Wilderness and Remote First Aid (AWFA) course is a five day certified course in Tofino. This course takes place from Friday evening through to Tuesday. Students will learn and practice; spinal immobilization, building splints, building stretchers, carrying patients in a stretcher over rugged terrain, treating hypothermia, re-aligning fractures and dislocation as well as a variety of other wilderness rescue procedures. Most importantly the course develops students abilities to help patients by developing wilderness emergency decision making skills required to assess patients and make evacuation plans. Red Cross instructor Emre Bosut, co-owner of T’ashii Paddle School brings 17 years of outdoor industry and instructing experience to T’ashii’s wildenress first aid courses. With a background in whitewater instucting and guiding Emre has worked around Canada and internationally as a guide in mountain, river, and surf environments.